New Bacolod-Silay Airport can accommodate an Airbus A-330, which can seat about 300 passengers while the apron is designed to hold five aircrafts at a time. A $140 million new airport of international standards has become operational in the central Philippines this month to complement the super region strategy of President Gloria Macapagal-Arroyo, which prioritizes tourism investments and energy independence.. 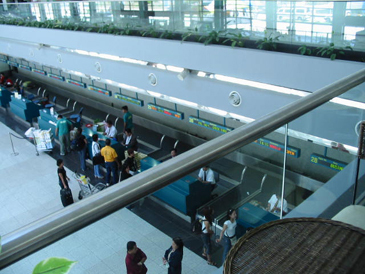 The New Bacolod-Silay Airport in the province of Negros Occidental of the Philippines, which was officially launched on Jan. 18, 2008 after three years of works, will meet the demand that will eventually increase the economic activity in the province and improve the lives of the Negrenses, Ms Maricon Basco-Ebron, tourism director and attache in Korea said. "The opening of the airport is a good development as there are three golf courses newly developed and refurbished by Korean investors now. The area can promote direct flights from Incheon or any part of Korea," Ms. Ebron said. Currently, the 2,000 meter-long runway can accommodate an Airbus A-330, which can seat about 300 passengers while the apron is designed to hold five aircrafts at a time. The three-level airport is equipped with state-of-the-art Passenger Boarding Bridges, which will make it easier for the elderly and people with disability to board and descend from the aircraft. It took three years for the construction of the airport, which was started in August 2004. The airport was made possible with funding support from the Japan Bank for International Cooperation. The new airport gives further emphasis to the super region strategy to promote and hasten further economic growth and development nationwide with the focus on the comparative advantages per region and provinces to promote more effective and efficient complementation in the forward-backward linkages," Ms Basco-Ebron said. This airport will open a gateway to regional centers and promote major tourism destination and to make tourism promotion the primary development plot to Central Philippines. Manila and Cebu are in less than one hour away from this airport. Bacolod City, is the capital and largest highly urbanized Philippine city of the province of Negros Occidental, famous for its MassKara Festival held during October. Known for being a relatively friendly city, it bears the nickname "City of Smiles." In celebration of the opening of the new airport, MassKara Festival I will get under way. MassKara festival is a Mardi Gras like celebration that masked and costumed street dancers, with fairs and carnivals. MassKara Festival is celebrated in the third weekend of October that is close to October 19. During the week-long festival, there are mask-making contest, food fairs, brass band competitions, beauty and talent pageants, a windsurfing regatta, drinking and eating contests, trade fairs and exhibits. The highlight of the festivities is the Mardi-gras parade that the street dancers dance in the streets with beautiful design mask and colorful costumes in the Latin rhythms Rio de Janiero style. Ms.Basco Ebron went on to say that the airport is President Arroyo's "promised, turned into reality" and part of the continuing effort of the Department of Transportation and Communication (DOTC) to elevate the Philippine's transport system to a global standard. She also said the new airport will give impetus to the President's vision of the Super Regions particularly with tourism promotion as the primary thrust for Central Philippines, thus opening up a lot of opportunity for development in this part of the country.